A backsplash is what you would find behind your bathroom vanity countertop that helps reduce damage to walls behind your sinks. They also provide a chance to add a personal touch to your bathroom or powder room. Materials range from stone to tile to glass. The possibilities are endless. While some vanities come with countertops and backsplashes, buying one without them can actually be easier and offer more customization. You can get installation done locally. This provides a chance for you to look at slabs and samples before you choose one you love. In the case of natural stone, computer screens and online photos don’t show a true representation of the piece of stone you’ll actually get. You can also decide on a custom height and choose edge details if you visit a local showroom. If your vanity comes with a countertop but no backsplash, be sure to take pictures or a sample of your countertop when purchasing your backsplash so you can see them side-by-side. Do I Need a Bathroom Vanity Backsplash or No? Some may say that backsplashes are only aesthetic, but others will say they are a necessity. If you don’t want your walls to get damaged…mold, mildew etc, backsplashes are a must. 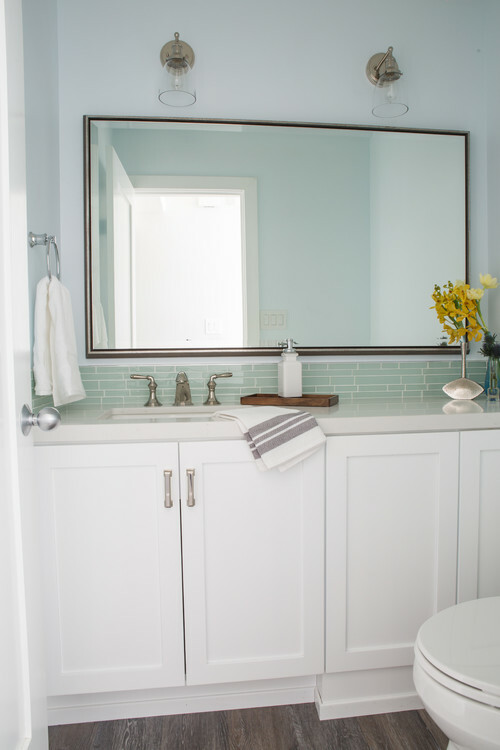 Depending on the type of bathroom vanity you have, you might be able to get away without a backsplash if you are trying to save some cash. 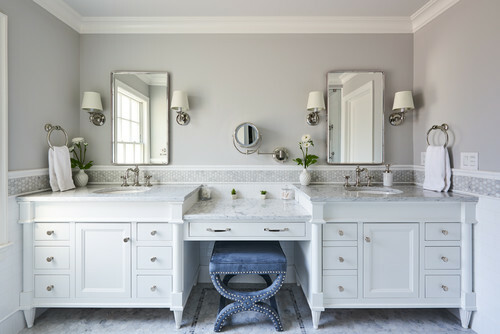 Say you have a pedestal sink vanity or a vanity that does not sit flush against the wall, in this case, a backsplash isn’t necessarily necessary. It would be more for looks and style in this case. 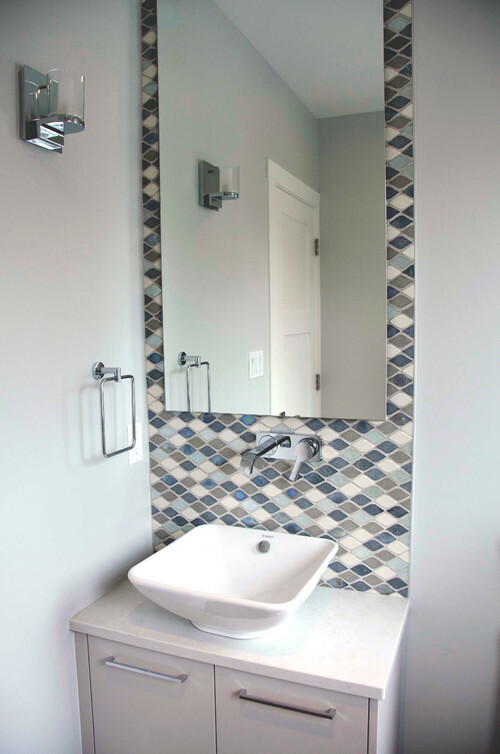 One of the most common questions we receive here at Unique Vanities, is how a client can find a backsplash that matches their vanity countertop. Since the majority of our vanities are sold without a backsplash attached (due to the extremely high occurrence of shipping damage) we knew this was something that we should address. Since natural stone is just that - natural - it is physically impossible to find a piece of stone that matches exactly to another. Like a snowflake, the striations in a natural stone vary from section to section. Truly though, that’s the way we want it. If every stone looked the same, we’d never have a truly unique countertop. 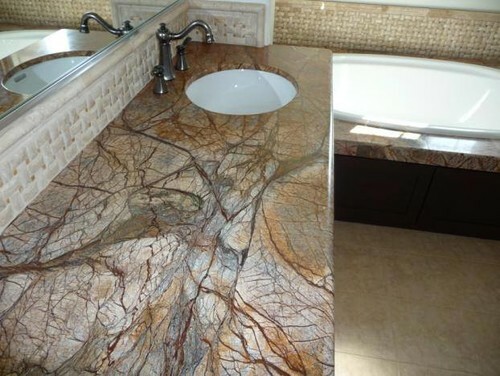 Natural stone is similar from piece to piece however, in color and pattern for the most part. 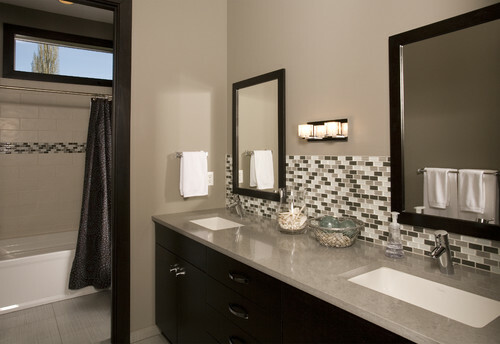 So, when you are searching for a backsplash to match your vanity, you shouldn’t have too much trouble. Home Depot and Lowes DO NOT carry remnants or "fall off" pieces of stone to use as backsplashes. They can however, give you a number of a local stone fabricator. 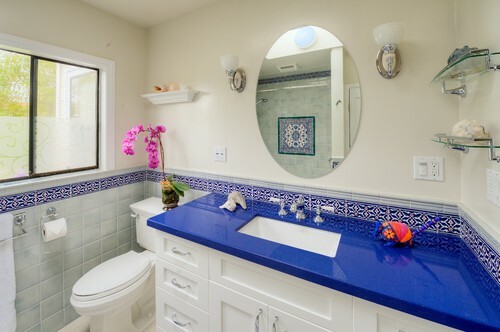 We recommend getting the number of more than one stone fabricator so that you are able to compare costs and sample colors to match your single or double bathroom vanity countertop. Once you’ve located the stone fabricators in your area, you’ll want to get a sample from each to compare to your stone at home. How to Choose a Backsplash? When choosing a backsplash, think of them as artwork. Materials range from metallic tiles to frosted glass tiles, and there are more natural styles like river-rock tiles. 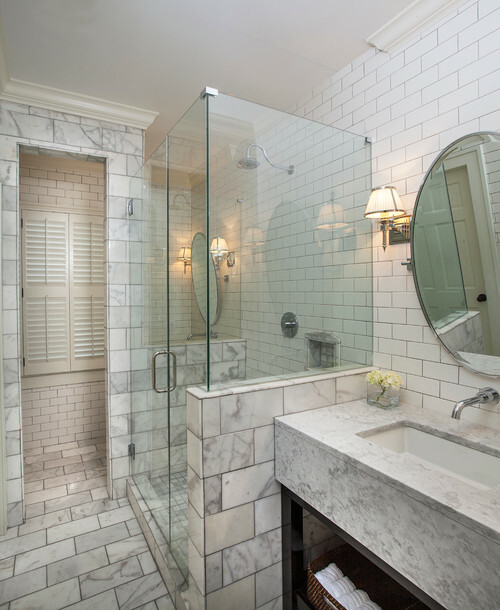 Shapes of tiles include options like traditional subway tiles (3in x 6in), hexagonal and even circular. Another choice for backsplashes is to continue your countertop. Because of the variations in natural stone, this option is best executed if you order with your countertop, to ensure that it matches well. If your countertop is a material other than natural stone, you are probably safe to order a backsplash to use with your existing countertop. What is the Standard Bathroom Backsplash Height? The standard height for a backsplash is usually 3-4 inches, but going with a higher backsplash will add elegance and a custom appearance. 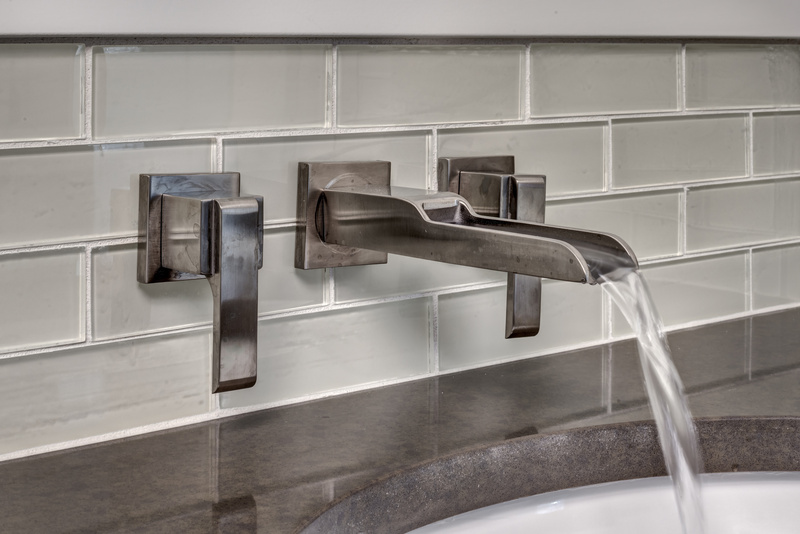 Consider using wall mounted fixtures with an extra high backsplash. Continuing the backsplash up the entire wall will add dramatic effect while doubling as a focal point. We do not sell backsplashes as a stand alone item. 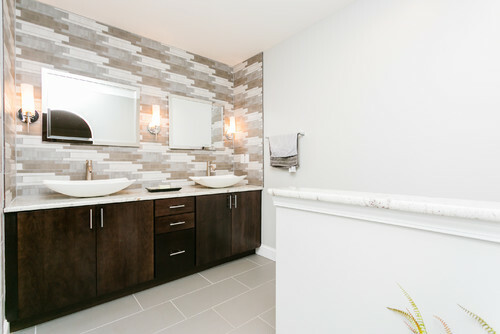 Have you noticed that all of our bathroom vanities are listed as no backsplash included, though some of the images of our vanities clearly shows a backsplash? We want to provide clarification and alternatives. When we first started in 2005, many of the manufacturers were offering backsplashes; some were attached, some not. Though every attempt was made to properly package the backsplash for shipping, we (along with many retailers) were experiencing higher than average damage rates to them. When we would ship out a new backsplash, it was nearly impossible that it would arrive intact. And I promise you, we tried everything. A long, narrow piece of stone just doesn’t mix well with any of the freight carriers. Because this inevitably ended in a poor experience for our clients, and us, the manufacturers themselves stopped offering backsplashes as an option. We currently offer a limited selection of vanities with a backsplash, but if it is damaged, we will not replace it as it’s nearly impossible to do so. Here’s the good news: you’ve got options. 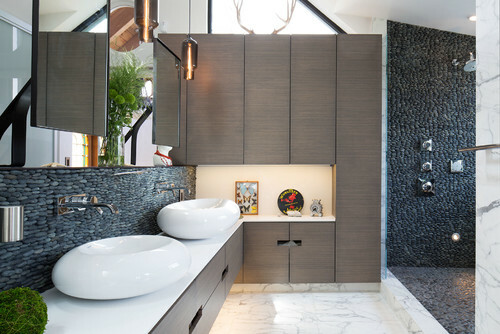 Often times, opting for a vanity without a backsplash leads to a more individual, unique design. 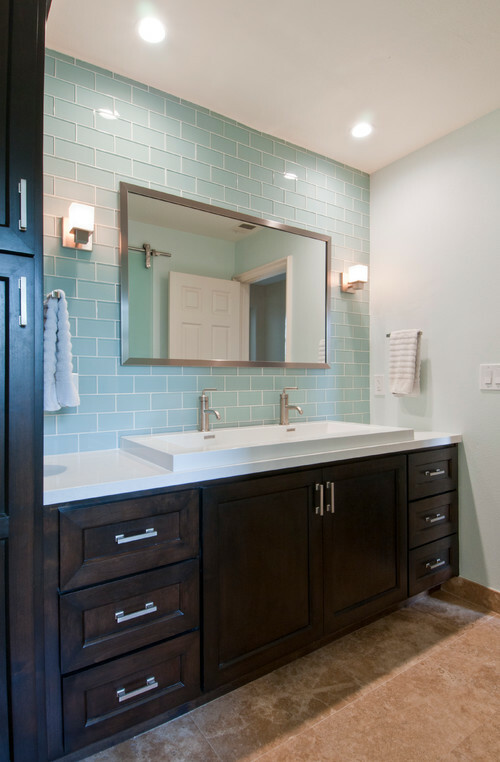 Simply speaking, your bathroom isn’t going to look like anyone else’s with the same vanity installed. 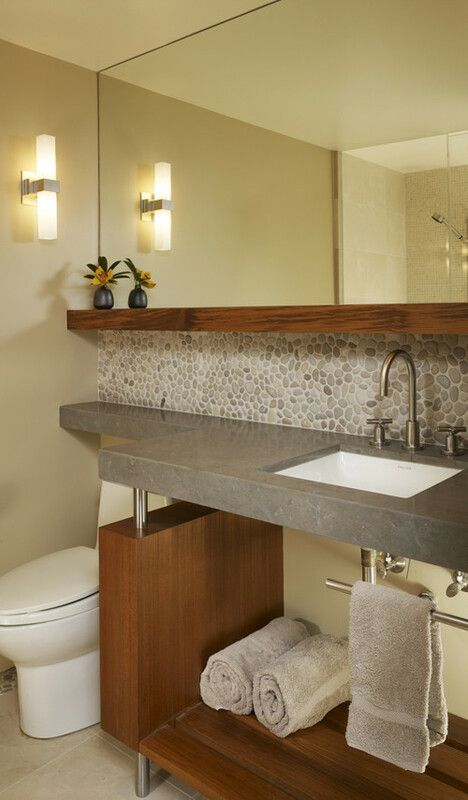 Here are a few ideas for creating a backsplash to fit with your bathroom project. 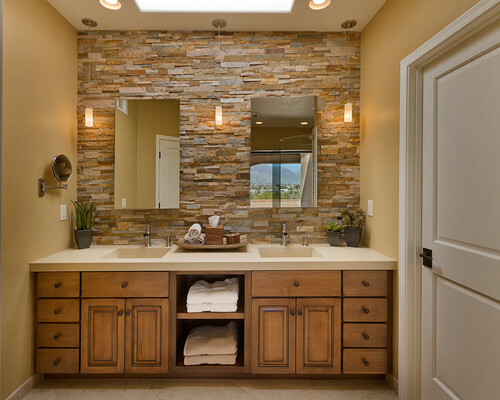 Still have questions or want to know if the bathroom vanity you're looking at comes with a backsplash or not? Click to chat with us below and we'll get the answer!